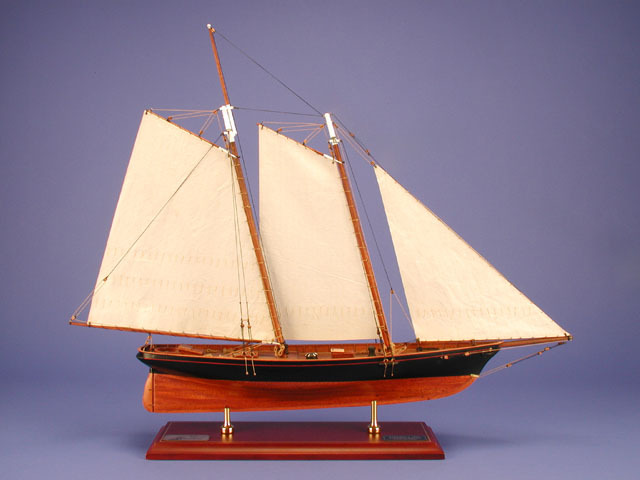 After being built for six members of the New York Yacht Club, the America, a schooner yacht, had a varied career spanning more than 90 years. She was designed to be the fastest racing schooner of the day and specifically to win honours from British yachts in British waters. This she accomplished well by winning the Royal Yacht Squadron’s Cup at Cowes, Isle of Wight, on 22 August 1851. The America’s Cup was named after her. Between 1853 and 1861, America had several owners. The first renamed her Camilla and took her on a cruise to the Mediterranean; on her return in 1861, she was sold to the Confederate government, who used her as a blockade runner. Scuttled during the Civil War, she was later raised and used as a training ship by the US Navy. She continued to race for more than 30 years before being laid up. She was presented to the US Naval Academy, but, as her condition deteriorated, she was broken up in 1945. Dimensions (L x W x H): 28.5" x 5.0" x 24.0"